Jay Cooke was born in Sandusky, Ohio, in 1821, to Martha and Eleutheros Cooke. His father was a lawyer and a member of the Whig party who served in the Ohio legislature and was a congressman in the early 1830s. In 1839, at just 19 years old, Jay Cooke went to work for E. W. Clark and Co., a Philadelphia banking house; just three years later he became a partner in the firm. His work for E. W. Clark ended in 1861, when Cooke established his own bank, Jay Cooke & Co. One of the bank’s first moves was to lend the state of Pennsylvania $3 million ($74 million today) for its part of the war effort. For the rest of the war he organized the sale of $500 million ($11 billion today) in bonds for the federal government. For this he was said to be “the man who financed the Civil War” for the Union. According to documented evidence (including Cooke’s own travel journal), Cooke first visited the head of the lakes in 1868. According to the St. Paul Daily Press of June 13, 1868, Cooke “and his party” left Detroit on June 11, steaming to Lake Superior “on business connected with the eastern terminus of the St. Paul and Lake Superior Railroad.” That railroad was designed as a “portage” railway, which connected large population centers with rail service otherwise unavailable. Residents of Minneapolis and St. Paul would take the St. Paul & Lake Superior Railroad to Duluth and then west as far as the Pacific Ocean (the railroad would be renamed the Lake Superior & Mississippi Railroad). Cooke’s stop at the head of the lakes was recorded by pioneer George Smith, who was a teenager at the time of Cooke’s visit—and an able boatsman. 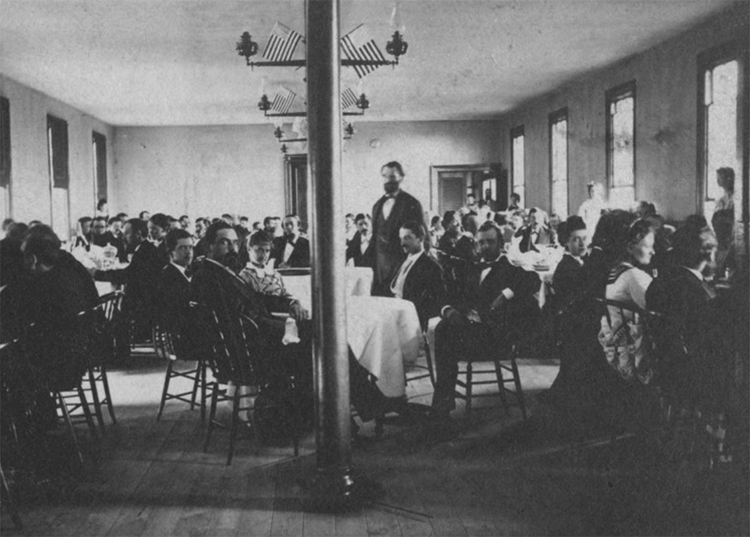 The proprietor of the Superior Hotel engaged Smith to be Cooke’s squire during his visit; Smith transported Cooke around Duluth and Superior in a rowboat. But Smith recalls the trip being in 1866 or 1867, not 1868. He recorded his experience long after the events took place and could easily have the dates wrong; there are no reports of such a visit in newspapers or in Cooke’s personal diaries, which recorded all his travels. Mr. Cooke stepped upon a large stump, and, taking off his silk hat and holding it in his hand, made a little speech to the Indians. He told them…he was going to build a railroad from the Mississippi River to the head of Lake Superior; that he was going to build a railroad from Lake Superior to the Pacific Ocean, and many other items of interest. After Mr. Cooke had finished his talk to the Indians, he…gave each one of the adult bucks and squaws a bright shining new 25-cent piece. To those who were younger, he gave a new silver dime, and to each of the little tots and papooses a 5-cent piece. After we had reached the Duluth end of the bay, Mr. Cooke discovered the numerous islands toward the Rice’s Point shore, and inquiries, as to what they were, what they were doing there, etc., came thick and fast. Suddenly he conceived the idea that he owned these islands, and intimated that he wanted to get out of the boat onto one of the islands, so that he might stand on his own land, way up in the far northern country. This notion of his brought on quite an argument. I endeavored to explain that the islands were but floating muck, on which grass bushes and some trees were growing, but on which a man could not stand. Mr. Cooke would not listen to any objections, but insisted that he must get out on one of the islands, regardless of the consequences.